How does a group from various Buddhist traditions respond to the pressing moral issues of our day? How do we bring Buddhism’s practices and teachings to the larger world without proselytizing, and without losing the unique perspective that Buddhism offers? And how can Buddhists, who traditionally eschew political involvement and partisanship, step forward for the good of all sentient beings, at what appears to be a pivotal moment in human history? 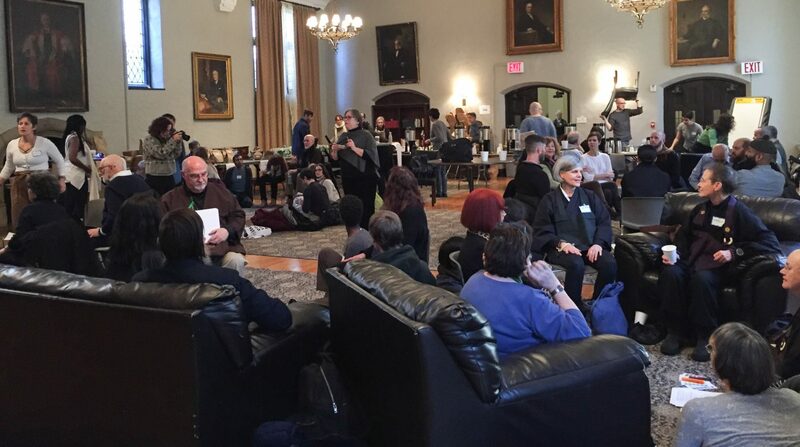 The organizers of Buddhist Action Day on February 3 tacitly acknowledged those dilemmas, while asserting that the overriding question facing Buddhism today is not whether to engage, but how. 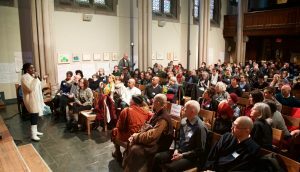 “I think the debate of whether Buddhism should be socially engaged is over,” said Dharma Drum teacher Rebecca Li, addressing more than 200 Buddhist practitioners—including nearly 30 from the Mountains and Rivers Order—who gathered at Union Theological Seminary in New York City to explore ways to take a more unified public stance on the unique challenges facing humanity, through right action based on the precepts. 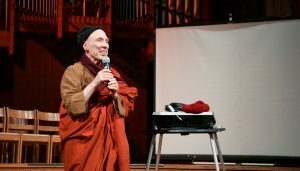 “There’s a widespread attitude among Buddhists, and I think especially Western Buddhists, that politics is something to be avoided, a kind of detour from our spiritual quest,” said the Venerable Bhikkhu Bodhi, one of the organizers. “We’re seeking spiritual purification, enlightenment, awakening, liberation—and to get involved in political issues, issues of public affairs, that is a distraction—a falling-away from our spiritual aspiration. In opening remarks, Snyder addressed the question of why this was happening now, when strife has been a part of human existence since long before Gautama placed himself under the bodhi tree. “For one thing, we’ve been asked,” said Snyder, also a priest and co-founder of the Brooklyn Zen Center. Requests for guidance have come from sangha members seeking to step forward, and leaders of other faith traditions have been asking, “How do we bring in Buddhists in a larger way?” he said. The day was about exploring questions, Snyder emphasized. 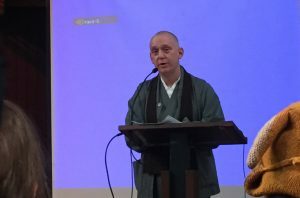 “How are we going to understand ourselves as self-identified Buddhists with attitudes, practices, teachings, worldviews, that make the presence of Buddhism meaningful, and even necessary?” he said. As Sensei Angel Kyodo Williams added later, it is our responsibility to take action as people who have chosen this path. 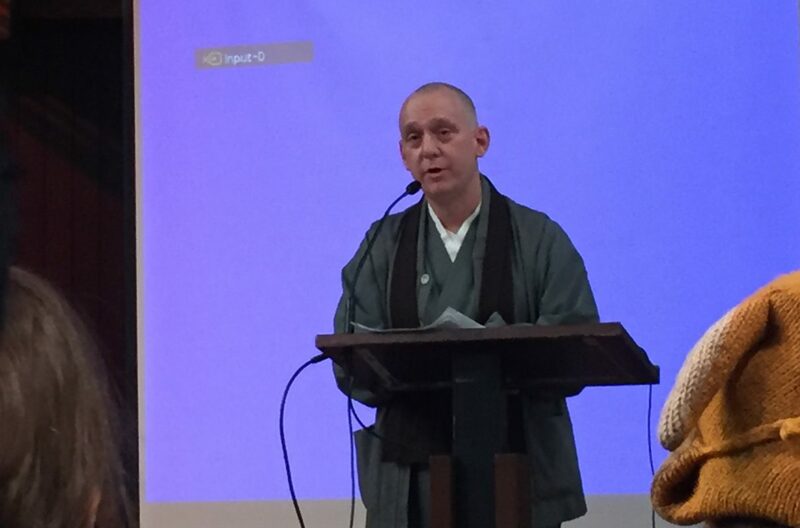 Buddhist teachers, sanghas and traditions from all around the New York area were present, including Shugen Roshi and sangha members, Roshi Pat Enkyo O’Hara of the Village Zendo and Sharon Saltzburg. Angel Kyodo Williams Sensei addressed the group via Skype. After opening presentations, participants divided into dyads to explore preliminary questions: What would the room have to contain in order for us to feel safe? What did we hope to accomplish? Like pebbles dropped into a pond, the interactions rippled outward as each dyad chose another, to make groups of four, and later doubling in size to form groups of eight. After a lunch break, participants returned to their eight-person groups and worked through the afternoon to expand the inquiry. Groups explored what such actions might look like, what they might need to have in place in order to move forward, and how they thought social action could be enacted. The day offered both structure and fluidity, as people who had never met attempted to establish bonds to sustain each other in difficult terrain. At each stage, they recorded on poster-sized paper a distilled version of what they had talked about. At the end of the day everyone did a walkthrough to see what the others had come up with. Many common themes emerged, including bringing Buddhist understanding to the broader movements, emphasizing stillness and equanimity; building bridges among Buddhist traditions with different histories, communities and relationship to the work; connecting with and being visible to one another. The mutual support that such cooperation could bring was also a source of strength, something many in our sangha had explored in its Dharma Action Day the week before on January 28 (with a second event at the Temple on February 25). 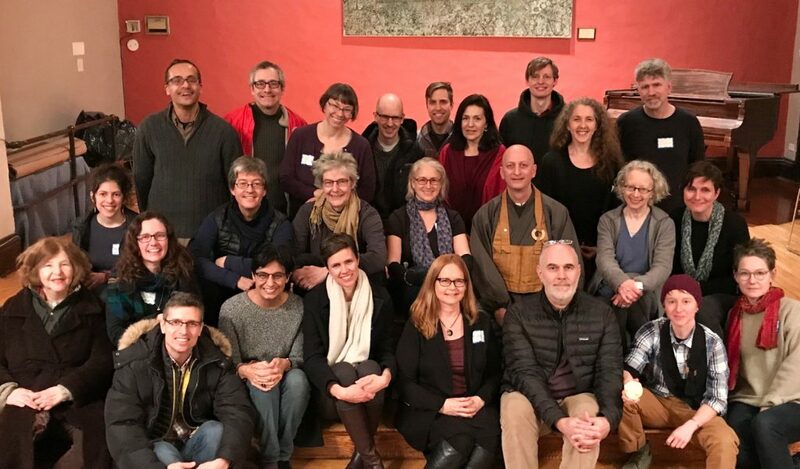 At the Monastery gathering, nearly 100 sangha members explored ways to marshal our collective concern for the world and channel it into actions of benefit. They learned about social, racial and environmental justice efforts already under way and had space to explore the question of whether, and how much, to get involved. 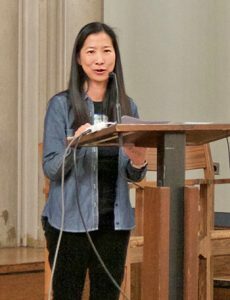 Indeed, even Li in her rousing introductory remarks acknowledged the delicacy of wading into activism. At the end of the day, Snyder expressed optimism. And what about people who are not interested in pursuing social action, or who feel that doing so veers too far into partisanship and politicization? Might they be alienated? Close to 30 members of the MRO sangha attended the event. Theresa Braine, MRO, is a freelance writer living in NYC.